One of the most common questions I get asked on breastfeeding and working is how I maintain my milk supply. Naima is almost 20 months old and she still takes expressed milk at home. I also still have excess milk which we donate (if substantial) or use in cooking Naima's food. I went back to work when Naima was 7 months old. At that time, my biggest fear was that I would not be able to express enough milk at the office for Naima’s next day feed. Happily, that has never happened. Naima’s daily milk intake has remained to be fresh (refrigerated, actually) and we’ve never had to dip into our freezer supply. In fact all my freezer supply gets donated every time my cook complains that we don’t have space for our frozen food (which used to be every 2-3 weeks but my intervals have lengthened into a month or so). Have been really busy over this week! So many activities - the breastfeeding awareness festival calendar project and rush work on top of that. I have several unfinished posts that I hope to get to by the weekend. In the meantime, would like to share these breastfeeding activities, begining August 5 and ending in an October event, which is part of a worldwide synchronized breastfeeding event. Children for Breastfeeding, Inc. and Nurturers of the Earth, Inc.
Wednesday, August 5, 2009, 12:00 noon – 1:00 p.m. Please confirm your participation as soon as possible. Call us up at our wireless PLDT phones701-4414, 701-4430, or SMART mobile phone +639198395555 or email us atthebreastfeedingclinic@yahoo.com.ph to include your name in the official guest list and ensure your admittance at Gate 1 of the Malacañang Palace. Malacanang Protocol officials require the organizers to submit the guest list at least three days before the event. Rizal Ceremonial Hall can only accommodate 500 guests. To avoid long queues, please be at Gate 1 by 10:00 a.m. As per Malacañang Protocol, all the guests should be seated at the Rizal Hall at 11:30 a.m. All breastfeeding children and babies are welcome. The use of feeding bottles and pacifiers will not be allowed. Attire: Semi-formal. Guests wearing denim jeans or “maong”, rubber shoes or sandals will not be allowed to participate in the ceremony at the Rizal Hall. After the successful presentation at the employees' association meeting, C and I started work on the proposal by preparing a survey for female employees. The purpose of the survey is to obtain data on how many female employees are currently breastfeeding or have previously breastfed (successfully or not). We also wanted to obtain information to determine the necessity of a lactation room and essential components thereof. Thanks to Google Docs, creating the survey form and compiling/tabulating the collected information was easy. Do normal SAHM days really look like this? *Sharing this seminar to new and soon-to-be moms. This will also be a chance for you to check out Medela items. To register, contact The Medela Moms (see information below). We would like to invite everyone to Breastfeeding 101: Beginning Breastfeeding. Arm yourselves with the power of knowledge so you can't be swayed by well-meaning family or friends to switch to formula! 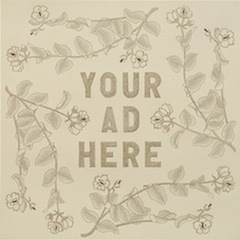 The class will be on July 25 at 10am. Speaker will be Ms. Abbie Yabot, leading La Leche League certified lactation counsellor. Organized by The Breastfeeding Club, fee will be P500 for non-members. Upon payment, you will be entitled to 2 other classes: Sustaining Breastfeeding (Sept 26) and Breastfeeding and Beyond (Oct. 24) and will have access to privileges and discounts from the sponsors (Medela, Prolacta, BabySmiths, Planet Noah, and HandyDandy Diapers). The class will be held at the Medela House - 29 1st St., New Manila, QC. See you there! Register thru this email or through 0917-5614366 or thru 725-3723/738-6272. HIPP, published by Manila Bulletin, is the newest parenting magazine in town. One of the columnists, Dona, asked me to contribute some tips on breastfeeding. Check out their issue for this month, which focuses on breastfeeding. 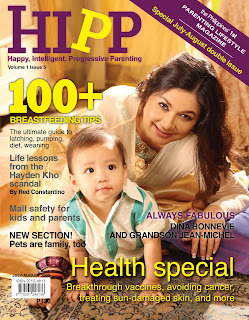 In celebration of the Breastfeeding Month (August), HIPP (Happy, Intelligent, Progressive Parenting) Magazine presents BREASTFEEDING 100, July-Aug 2009 issue. Available NOW in all magazine stands. Real Moms (and Dads!) give you 100+ breastfeeding tips - from latching to weaning, from teething to twiddling, from newborns to toddlers, from feeding at home to pumping at work, from enjoying the time with your little baby to enjoying time with your babe. Be informed and be inspired. There was a time when all you needed to breastfeed were a breast and a baby. Is it consumerism that is creating a need for products when there was originally none? I'm always online and I have seen several breastfeeding accessories that I didn't realized I needed or didn't even think existed. If you're directly breastfeeding your baby and not going out yet, you'd think that you won't really need any breastfeeding accessory. But did you know that there are special pillows for your breasts? Utterly Yours breast pillows are crescent shaped pillows which moms can use to support and position their breasts. These pillows have surprisingly been given favorable reviews. When I was looking for a nursing cover, I thought there was only 1 type - a bib or over-all apron type to cover the essentials. But creative moms have thought of new products to be used as a nursing bib. A modified bib is The Breastfeeding Butterfly which you tie around yourself to create a cover on the side where your baby is feeding. It looks a bit difficult for me to use, especially with a fussy, impatient baby. For those whose babies don't want anything over them, there's the Slurp N Burp, which is actually a sash with cleverly design slits to expose the least amount of breast possible. It has a local Pinoy counterpart - the Nurse N Burp. Also a cute "cover" is the Moboleez - a breastfeeding hat. The Moboleez hat is worn by the nursing baby and has a wide brim to cover the essentials. I like these 2 "covers" because they don't actually cover the babies/breastfeeding. However, they still provide some sort of "shield" for moms who are uncomfortable with nursing all-out in public. For milk storage, I used to think that I only had 2 choices - a bottle or a bag. Apparently, there are a lot of ways you can store milk. 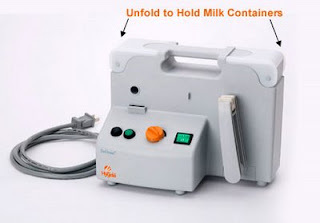 There is a special bottle storage - a vacuum milk storage system - the Milk Bank - which promises to deliver the freshest milk possible by removing harmful oxygen from storage. There is also the MilkSaver, whick you use like a breast/nursing pad but stores milk leakage, instead of absorbing them - acts kinda like a breast shell. One product which I use is the milk trays - Sensible Lines since it allows me to freeze milk in small amounts without taking up much freezer space. 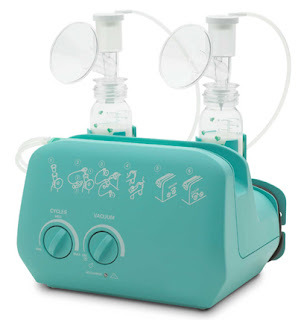 Finally, for pumping moms, a primary concern is hands-free pumping which you can actually set-up on your own. There are products such as PumpEase and Easy Expressions which sell because moms want to pump hands-free the easy way. The Freemie also capitalizes on hands-free pumping but what makes it different is that you attach it to your pump, use it instead of your pump horns, conceal it in your bra and pump away. These are just a few of the "innovative accessories" I've seen which makes me realize that breastfeeding moms are and can be a huge market. But really, no purchase is necessary to breastfeed. 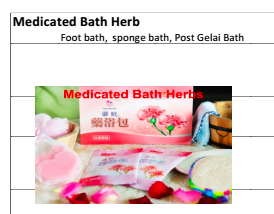 In fact, Kellymom has a great chart enumerating alternatives instead of purchasing these accessories. And for a 3rd world country like the Philippines, what is really essential to successfully breastfeed is not fancy accessories but really, just the determined mom and hungry baby. L.A.T.C.H. will be conducting its monthly Breastfeeding Class for Expectant Couples, this Saturday (July 11, 2009) at The Medical City from 9am-12nn. This is free but on a first come, first serve basis. Classes will be at the 4th Floor, Conference Room 1. Class topics include Breastfeeding Benefits, What to Expect in the First Week, Positioning and Latching, Back to Work and Busting Breastfeeding Myths. Also, this Saturday will be La Leche League Philippines' (Best Friends in Breastfeeding) monthly meeting at Mary the Queen Parish from 9-11am. I attended this meeting last month and you can read about my experiences here. So which one to attend? If you're pregnant, I suggest you got to L.A.T.C.H. 's class. If you're already breastfeeding, check out La Leche League's meetings which are more informal and is not focused about the basics of breastfeeding. Father's Day 2008 was very memorable for us - not only was it Stan's very first father's day, it was also Naima's 1st day of trying out solids. Prior to that, she was exclusively on breastmilk. I read a LOT on how to start solids. The general idea I got from my research was NOT to start a baby on solids earlier than 6 months. Although this statement is supported and promoted by the World Health Organization, there are still a lot of doctors who recommend starting babies on solids at 4 months, especially if these babies are on the lower percentile of the formula-fed babies based growth charts. 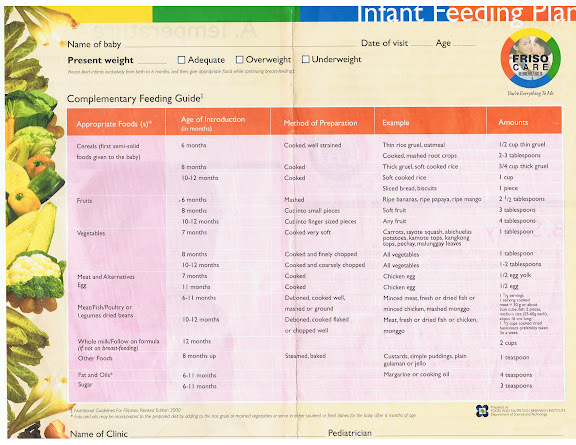 During a visit to one of Naima's former pediatricians, I was able to get an "Infant Feeding Plan" produced by our Department of Science and Technology's Food and Nutrition Research Guide. I was happy that the plan promoted solids at 6 months and not at 4 months. There have been studies which state that starting solids before 6 months increases risks of allergies but despite these findings, there are still books or doctors who suggest that babies start solids at 4 months, especially when the baby is *off* the infant growth charts (which are based on formula-fed babies). Also, Kellymom believes that starting solids too early and feeding baby too many solids often results in the early weaning of breastfed babies. 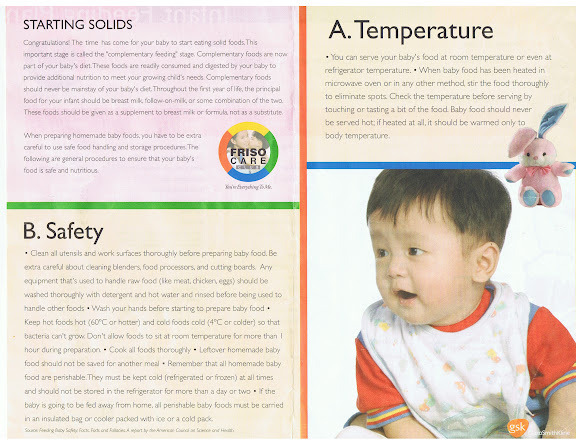 The plan also provides a list of locally-available foods that you can feed your baby. I think the use of indigenous foods for complementary feeding is very important. However, I think Filipino moms are not that well-educated or there is lack of information on what indigenous foods are available and can be used for complementary feeding. I also don't know much about indigenous foods and the indigenous foods (that I can recall) we fed Naima would include: camote (sweet potato), banana (lacatan and tundan), sayote (is this indigenous? ), papaya, calabasa (squash) and monggo. Naima has been eating a lot of vegetables, like broccoli, carrots, cauliflower, spinach, potatoes, tomatoes, zucchini, asparagus --> which are all locally grown but are not indigenous to the Philippines. Not knowing much about indigenous foods is one of my challenges towards crafting a healthy meal plan for my family. 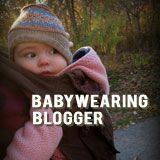 In preparing for Naima's first solids, the websites Wholesome Baby Food and Homemade Baby Food were very helpful. I ignored the suggestions to start at baby's 4th month but instead used their charts, starting at 6 months. I like that the foods are organized according to baby's age and meals. There are also suggestions for menu planning. Kellymom and Mother-2-Mother were also very helpful as they focused on the breastfed baby. Aside from the internet, I also use The Big Book of Recipes and Feed your child right - a book for Asian Parents. When starting solids, it is important to remember that despite all the literature telling you to start solids by the 6th month, it is actually your baby who will give you the signal that s/he is ready, whether it be in his/her 6th, 7th or even 10th month. There are signals to watch out to determine readiness. Each baby is unique - so it definitely won't help if you compare how easily other babies started solids, as compared to your own baby. It should also be noted that contrary to popular notion, starting solids does not mean that breast milk (or even formula milk) intake should lessen. Solids are only meant to COMPLEMENT the milk feeding and not replace it (*note how the guide above is called "Complementary Feeding Guide"). Kellymom has an excellent explanation on complementary feeding and also recommends that babies be given solids an hour after nursing. Naima's first food was avocado, mixed with breastmilk. I chose to start with avocado and not am or lugaw (rice porridge) because my readings showed that avocado had more nutrients than rice. 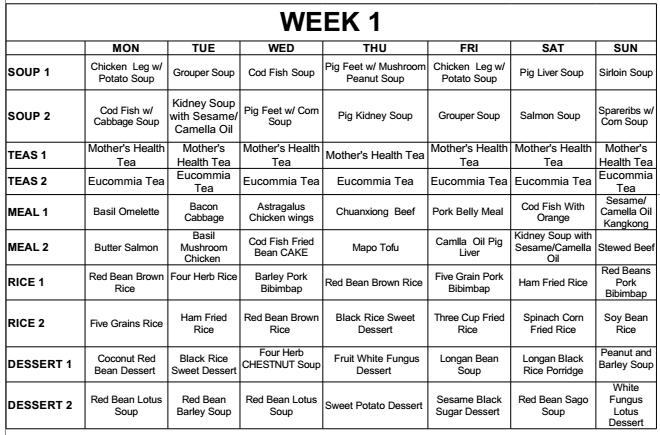 I followed the 3-day rule (feed baby same food for 3 days to check allergies). Happily, Naima did not seem to be allergic to any food. Naima has never tasted Cerelac and I don't plan on giving her any. She also hasn't tried Gerber but has eaten about 3-4 bottles of Earth's Best, given to her when we were traveling and had no access to cooking or a kitchen. Before Naima was one, I did not want to give her any restaurant food and we usually packed her meals to take along during our meals out. Starting solids is an exciting milestone which must not be rushed. It is now a little over a year since Naima started solids. Now, she pretty much eats anything EXCEPT shellfish. As she grows older, her menu choices expands but so does her palate/taste preferences. There are days when she eats A LOT and days when she just nurses and nurses. We are now facing the challenges of feeding a finicky toddler. Last Saturday, I was finally able to visit Maricel and Beng’s newly-opened Medela House for the first time. I originally intended to attend Abbie's Breastfeeding 303 class but I didn't count on waiting for Naima. 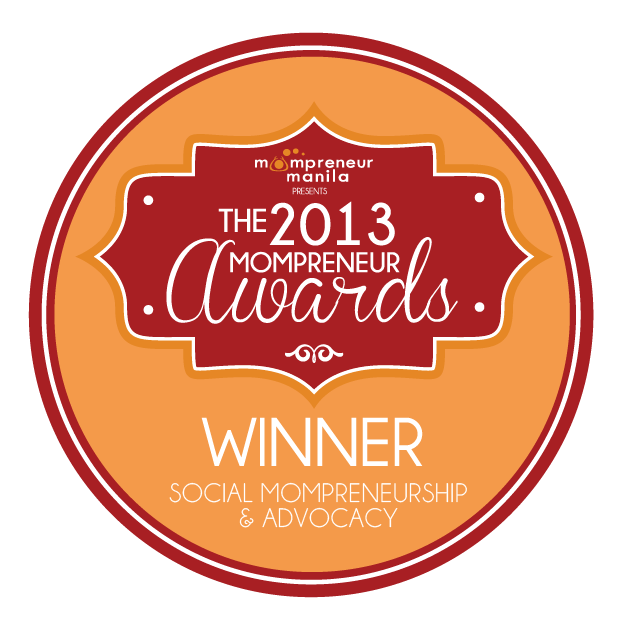 Maricel and Beng are the Medela Moms who distribute Medela breast pumps in the Philippines. Their showroom/stockroom used to be in Beng’s house. However, they’ve seen it fit to rent a space aptly called “The Medela House”. The house was actually a bungalow which they are slowly converting into a showroom. I was pretty impressed with their plans. Maricel gave me a short tour and briefly explained their plans for the house. Since the house had several rooms, they reserved a couple of rooms for their children to stay-in (ala daycare at work). The living room was converted into a lecture/session area. It was unfurnished, with soft rubber mats on the floor. It also serves as a "holding place" for the babies and toddlers while their mommies are listening to the lectures or participating in the seminar. During the Breastfeeding 303 class, Judy of Babysmiths brought some of their Wonderworld wooden toys which the babies and toddlers had fun playing with. Naima has a rocking caterpillar I got from Judy and she enjoys playing with it. One room near the main door currently serves as their office, with the computers and boring stuff. The room beside it has been designed to be their showroom. This is where they display their pumps and other accessories. This also serves as their consultation room, where they help moms fit the shields and horns or assist moms in latching their babies. What interested me most was the back room, which Maricel said will serve as their library and rental/pumping station. Maricel said that Medela will generously supply the books for their library. This is very good news since there are not a lot of good books in bookstores on breastfeeding. However, the books cannot be taken out of the premises. The Medela Moms are also looking towards operating the first *real* pump-rental station in the Philippines. Currently, rental pumps are just not available in the Philippines. Four major Metro Manila hospitals allow you to rent their pumps but only the Medical City has hospital-grade pumps! The rest of the hospitals rent out either an Avent electric or Medela double electric which I'm sure are NOT hospital grade/multi-user pumps. Filipino moms are not aware of the differneces of hospital-grade multi-user pumps and regular pumps. During last week's lactation program presentation, we suggested the purchase of hospital grade multi-user pumps for the employees. The institution can then provide each pumping mom with 1 set of horns (to be taken from their medical allowance) and moms will just purchase extra sets of horns if they wish. However, one of the representatives objected and said that it was unsanitary to share pumps! I explained that it was going to be a hospital-grade multi-user pump but she still thought it was cleaner for each mom to bring her own pump. 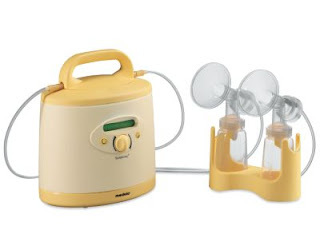 I thought it would be more practical (and cheaper for the moms) if the institution provides a hospital-grade pump in the lactation rooms since new moms need not purchase new pumps but would just need to get horns. However, I guess more *information* about hospital-grade pumps need to be shared in our institution. Maricel shared though, that their hospital-grade pumps (Symphony) can only be used within the Medela House and cannot be rented out. I told her that it would be quite impractical with traffic and all. However, she said that it would be impossible for them to rent out the expensive Symphony pumps without a huge deposit. Requiring a huge deposit would be contrary to their objective of providing the hospital grade pumps, which is to give moms who can't afford the Pump-in-Styles access to a good pump. I shared that when I used to rent my Ameda Elite abroad, the rental station required me to swipe my credit card and informed me that if I fail to return the pump, they will automatically charge the succeeding months' rental until I return the rental. The Medela Moms currently do not accept credit card purchases but this is something that they may want to look into once they start their rental station. 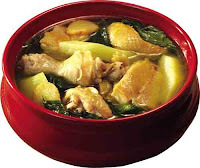 The Medela House, #29 1st St., New Manila, Quezon City (725-3723, 738-6272, 0917-5614366). Coming from Greenhills, it's before you reach Aurora Blvd. From E. Rodriguez, go past Auora Blvd. It's beside 8 Gilmore Place.